I've never been a Sig fan, mostly because of the blocky looks. Well I've been finding myself in need of something smaller for carry with somewhat tighter shirts. Having switched to hammer fired and not looking to go back to striker fired guns the choices were somewhat limited so I picked up a Sig P938 today, off to the range tomorrow. Excellent little pistols, but a bit on the heavy side for carry for us little guys. I shoot with some guys that really like their P938’s, Carson! Not even, Lee! 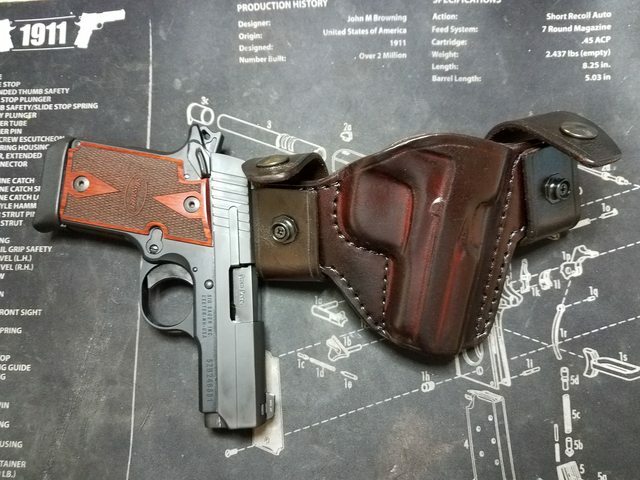 You know that with a good belt and holster you can carry pretty much anything you want, though that’s not really necessary to carry one of those little things. It sounds to me like “someone” has convinced themself that they “need” to pocket carry a .380. Don't know about "heavy", fully loaded it's the second lightest pistol in my safe, the lightest being a Ruger LCP that I hate, it hasn't been out of the safe in at least 3 years. It's about 8 oz's heaver than the LCP. Have 2 holsters on the way for it, one from Panther and one from Little Bear. Ya know, sometimes ya got to go with Kydex and sometimes ya got to go with leather. 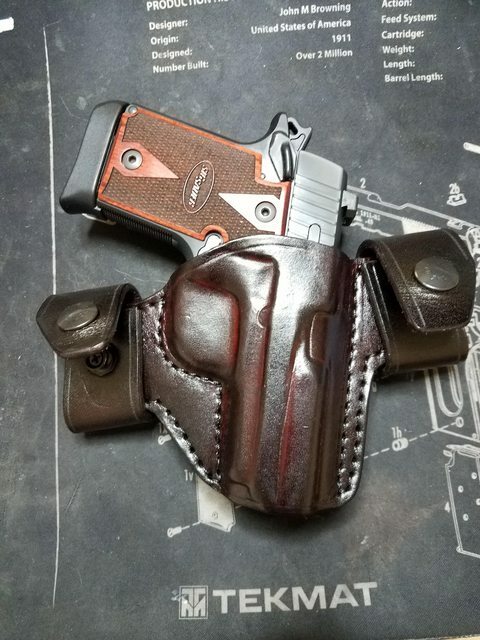 Thought I'd add a couple of shots of the holster i got for this little guy Little Bear Custom Holsters, Dave does great work. I know they are well made little pistols and very accurate. Its my friend also named Dave that just tosses it in his cargo shorts that claims its way to heavy for loose pocket carry. Me, I always use a pocket holster for pocket carry and yes, have been carrying a 380 for many years. More of a last ditch self defense item rather than something you would take to a serious gunfight. Just gotten lazy in my older age, I guess. Oh I agree sig, I wouldn't pocket carry it but then I haven't pocket carrying in many years and then only once or twice, didn't like it.